Spring 2013 Proves to Be Banner Year For Vermont Maple Syrup Production! After a freak weather event in March of 2012, where Vermont experienced 80 degree weather for nearly a week right in the middle of “Sugaring Season” everyone in the maple world knew that 2013 had to be better. As all Vermont “Sugarmakers” prepared for the season by stringing pipeline, clearing paths in the deep snow, preparing the “Sugarhouse” for boiling, and so much more, we would watch the weather in anticipation of a trend that would show us it was time to tap our Hard Rock Sugar Maple Trees in the rugged mountain groves of Northern Vermont. 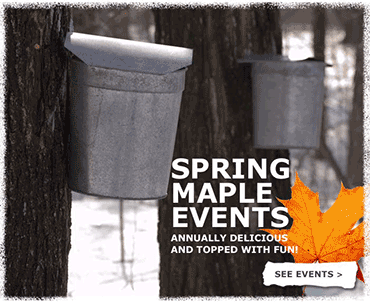 Spring Maple Events are just around the corner. Start planning now. In the old days, tapping usually began around town meeting day in Vermont which was the first Tuesday of March. Now, with perhaps a bit of global warming factored in, we had to be ready to go in February. This year, depending on the sugarbush location, and elevation, we saw perhaps 4-5 good sap runs in February. Just about all the syrup produced from this fresh, cold, early season sap produced delicate, pure flavored Vermont Fancy Grade Maple Syrup. This flavor is preferred by some as a table grade maple syrup to use on pancakes and waffles, however, it is also commonly used where its delicate flavor can be most appreciated on fruit, over ice cream, or to delicately sweeten warm or cold beverages. The first part of March saw a cold spell in Vermont lasting 10 days or so where the temperature never climbed above freezing. Then, towards the middle of the month the magic happened. Day after day we would experience a good hard frost at night followed by a warm day – warm enough to thaw our trees out right down to their roots. The sap began to flow and flow. Day after day we would collect the sap, night after night we would boil it down into “The World’s Best” maple syrup. Early in the season the sap was nice and sweet around 3% sugar content. Later, the sugar dropped slightly but the flow of sap was heavy, ideal for Vermont Grade A Medium Amber and later, Vermont Grade A Dark Amber. Overall, it takes about 40 gallons of sap from the tree to boil down to just one gallon of maple syrup. With a good, long maple season in Vermont with abundant sap flow we at Dakin Farm are predicting a record year for Vermont Maple Syrup production once the numbers are all in. Vermont produces the most maple syrup in the United States and due to our climate, geography, soils, and heritage, many people throughout Vermont and around the world feel we also produce the best maple syrup that it is possible to produce! Stay tuned to this blog to learn how the tremendous increase in Vermont Maple Syrup Production is leading Vermont to adopt a set of International Grading Standards which have been developed over the past 11 years by the Vermont Maple Industry along with the International Maple Syrup Institute, providing both a color and flavor descriptor making it easier for everyone to understand the difference between the grades as the market for pure Vermont maple syrup continues to grow. Dakin Farm Easter Ham – Taste the Difference!